Akash Anand, the 24-year-old nephew of Bahujan Samaj Party (BSP) chief Mayawati, took her place at the Agra rally of the mahagatbandhan on Tuesday. The BSP pitchforked Akash, considered her aunt’s successor in the party, on the big stage as the Election Commission (EC) has barred Mayawati from campaigning until Thursday morning. 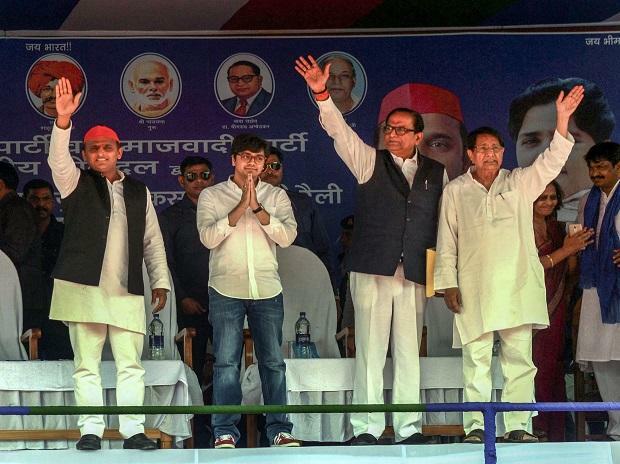 Akash, the son of Mayawati’s younger brother Anand Kumar, occupied the seat reserved for his aunt on the stage and sat alongside Rashtriya Lok Dal’s (RLD’s) Ajit Singh, Samajwadi Party’s Akhilesh Yadav and BSP’s Satish Chandra Mishra. He was the first to address the meeting, which he began with the cry of ‘Jai Bhim’, or victory to Bhimrao Ambedkar, and appealed supporters to vote for gatbandhan candidates. In his brief speech, Akash thanked supporters for turning up in large numbers. “My seniors are sitting on the dais but I am appearing before you for the first time and want to make an appeal... will you all listen to me?” he said reading from a written text. “I hope you all would listen to what I have to say and vote in such huge numbers that our rivals forfeit their security deposits. This will be a befitting reply to the EC,” Akash said, ending his speech with her aunt’s signoff “Jai Bhim, Jai Bharat”. BSP’s Mishra defended his party chief. He said Mayawati’s speech in Saharanpur on April 7 was to make people aware about Uttar Pradesh Chief Minister Yogi Adityanath’s attempts to divide the voters by using the “Ali-Bajrang Bali” formulation. Akash, a business administration graduate from London, intermittently seen in BSP’s public meetings at least since the UP Assembly polls in February-March 2017, but has become a more permanent fixture by Mayawati’s side during the current election campaign. He was present when Yadav visited Mayawati’s residence on January 15 to seal the alliance. At the gathbandhan’s inaugural rally in Deoband, Saharanpur, on April 7, Akash’s presence was specifically acknowledged from the stage when the rally concluded. The BSP has identified him as one of its 20 ‘star campaigners’ and his name on the list finds its place after Mayawati and Mishra. In January, Mayawati had criticised the media for calling Akash her successor. She had then Akash would need to learn the ropes, and she plans to induct him into the BSP movement. There had been media coverage on Akash’s blue suit and footwear. “Certain media houses mischievously tried to drag my nephew Akash in the entire controversy and even wrote false reports on his footwear. Now as a befitting reply to such people, I would like to announce that I will now induct Akash into the BSP movement to understand the struggle of BSP and to further strengthen it,” she had said. Akash’s father has been under the scanner of probe agencies for the past couple of years. Mayawati had appointed him the national vice president of the party, but relieved him of the responsibilities in the party when she faced allegations of promoting her dynasty. Meanwhile, Home Minister Rajnath Singh filed his nomination papers from the Lucknow Lok Sabha seat and held a big roadshow. Poonam Sinha, wife of Congress candidate from Bihar’s Patnasahib constituency, joined the Samajwadi Party. She is set to be the gathbandhan candidate against Singh in Lucknow. The BJP’s difficult relationship with ally Suheldev Bharatiya Samaj Party (SBSP) continued. On Tuesday, SBSP chief and state minister Om Prakash Rajbhar said his party will field candidates on 39 seats in the state as talks with the BJP remained unsuccessful. “The BJP asked me to contest the Ghosi seat on the BJP symbol, but I declined,” Rajbhar said. On Tuesday, campaigning ended for the second phase of the polling, scheduled for Thursday. In this phase, 97 Lok Sabha constituencies, spread across 12 states and a Union Territory will go to polls. All 39 constituencies of Tamil Nadu will go to polls in this phase. Other constituencies are 14 in Karnataka; 10 in Maharashtra; eight in Uttar Pradesh; five each in Assam, Bihar and Odisha; 3 each in Chhattisgarh and West Bengal; two in Jammu and Kashmir and one each in Manipur, Tripura and Puducherry.